Open chocolate pie crust and set aside. In a stand mixer, beat together cream cheese, marshmallow fluff, coconut extract, almond extract and vanilla extract. Stir in the cereals by hand, reserving 2 tablespoons of each for sprinkling on top of the finished pie. Spoon mixture into the pie crust, using a spatula to spread it evenly. Pour 1-1/2 tablespoons of corn syrup into each of 3 small bowls. Tint one red and one purple. To the third bowl, add the chocolate chips and melt in the microwave. Drizzle all three over the prepared pie. Sprinkle reserved cereals on top. Place candy eyes around the top of the pie. Slice, serve and enjoy! Store leftovers in the refrigerator. 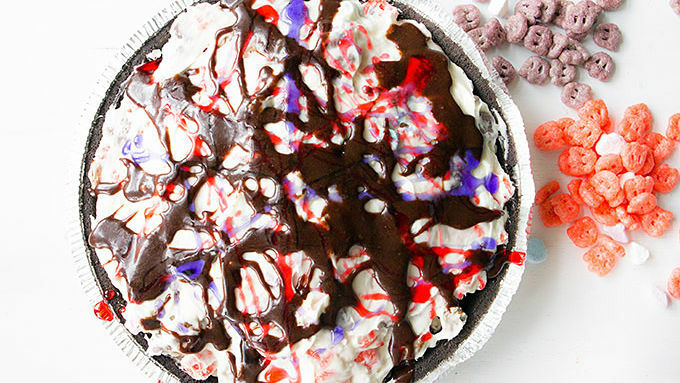 Alternate topping: Spread whipped cream on top, sprinkle top with monster cereals, serve and enjoy! Need a quick Halloween treat? Try marshmallow pie with googly eyes. Monster cereal alert! They’re on shelves everywhere, and you have GOTTA get ‘em quick! 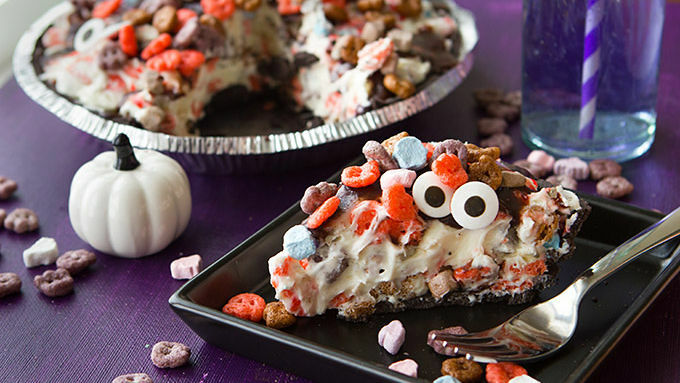 Pour milk on them, make an adorable monster cereal parfaits, or mix ‘em into this delicious Monster Mash Marshmallow Pie. It’s the perfect way to turn your Halloween into a scream! 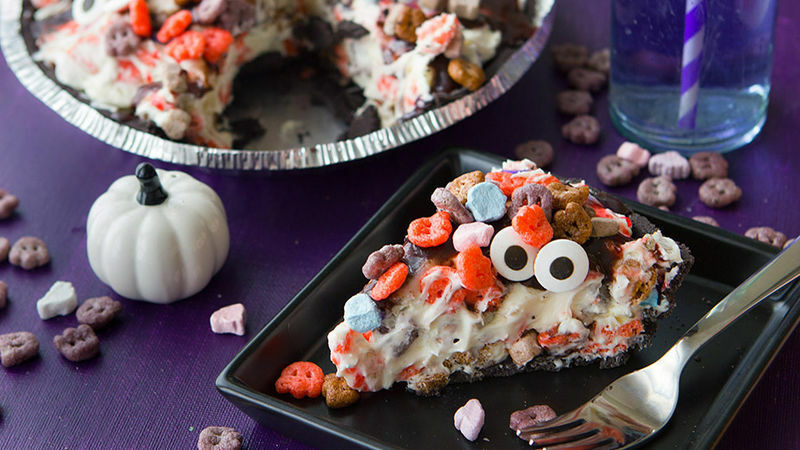 Finish it all off with sprinkles of the monster cereals and some candy googly eyes peeking out from the pie. 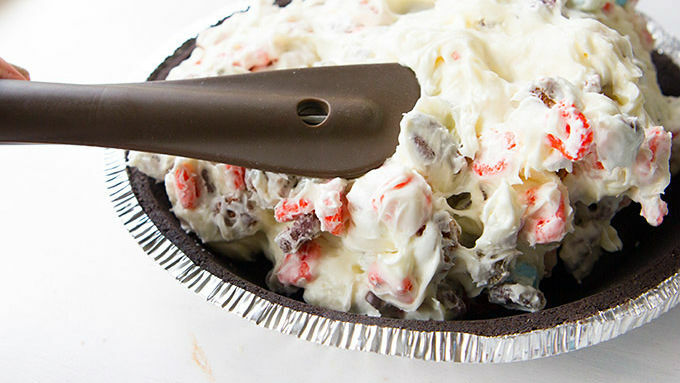 That little touch will make this pie the life of the party. Look how fun! It’s like the pie is just begging you to say hi. Slice, serve, scream! Halloween was MADE for monsters like you.